Integrate with WordPress, SquareSpace, Weebly and more. Utilizing membership tracking software (or a membership CRM) can empower your staff, board and volunteers to support your members. It will allow them to quickly field phone calls from members, be better prepared when meeting members at events and ensure your members’ needs are met. Another important reason to use membership tracking software is to allow you to take vacations and sick days. If all of the membership information is in your head, or filed using a system only you understand, your organization will have no choice other than contact you whenever there is a question from a member. It all starts with creating good habits. When a member calls the first thing you should do is pull up their profile and check for notes or past conversations that may assist you. You may see a note that they have been given 90 extra days to pay their membership fee. This would keep your from asking for their next payment and making them explain a potentially embarrassing situation again. Know what is and isn’t automated in your system. For example if a member pays by credit card through MembershipWorks the payment is automatically recorded and their next renewal date updated. However, if they pay manually by check the administrator will need to enter the payment and update the next renewal date once the check clears the bank. Doing this will ensure that your organization has high quality, accurate records. 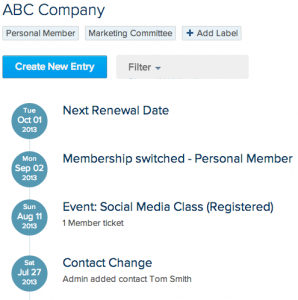 Make sure that anyone working with your members understands how to update the membership crm or gives notes to the person in charge of updating the membership crm. Set simple guidelines for what to record and when it should be recorded. All of your members, except lifetime memberships, should have a next renewal date. If you are giving a member a free month or year of membership, make sure to record the next renewal date accordingly and add a note to explain why they are receiving the free membership. Move expired members to a different folder instead of deleting them so that you don’t lose all of their information. Keep your members’ emails updated. MembershipWorks will let you know when an email you send through our system fails to reach your member. When this happens call your member and get their updated email right away. If you talk to different people at your member’s business, family or organization, add them as additional contacts in the member’s profile. Use the Timeline to record conversations, notes, payments, donations, event attendance and more. This video will show you how it works.